This pdf clocks in at 17 pages, 1 page front cover, 1 page editorial/ToC, 1.5 pages of SRD, leaving us with 13.5 pages of content, so let’s take a look! 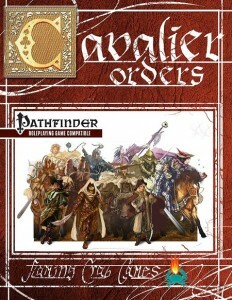 All right, so without much ado, this pdf kicks off with the first order – and you’ll notice something from the get-go: Each of the orders herein receives an absolutely gorgeous, high-quality original full-color artwork – with the respective cavaliers being represented together on the final page – this is an aesthetically pleasing pdf. The first order would be the order of the Black Rose – and it is already a high-concept one, with challenge targets having their AC against melee attacks penalized. Second level nets undead-controlling 3+Cha-mod times per day, of up to cavalier levels in HD. 8th level provides a double-edged sword – being healed by negative energy and harmed by positive energy. At 15th level, the order can hamper the divine channeling of targets. Feat-wise, the order can get an undead mount. Solid take on the Death Knight-trope. The order of the Claymore gets better Intimidate versus targets of his challenge and is all about strength and leaving no doubt about it – when using Spirited Charge in conjunction with Claymores, he deals triple damage and when battling higher CR foes, his challenge scales up to the HD of the target creature – interesting! Finally, whirlwind-like tricks complement the order. Also cool: There are two feats that help middle-aged and older cavaliers of this order retain their powers. The Order of Cold Iron, as the name implies, is about defeating demons and challenge-wise, gets save-bonuses. The mount of the cavalier’s natural attacks are treated as cold iron and at higher levels, may decrease DR of cold iron-susceptible foes with every crit. As a high-level ability, they can send creatures back to their home planes as per dismissal. (Which should be italicized, but that’s a nitpicky complaint.) Feat-wise, they can have their mount/familiar’s natural attacks count as silver and magic. There is also an interesting feat that turns DR against creatures that have them: Provided your weapon bypasses the DR, you deal bonus damage equal to the bypassed DR on a critical hit- which is BRUTAL. Sure, it is circumstantial, but ultimately, for the price of one feat, this exceeds the efficiency of quite a few class features. Seeing how quite a few creature have high DRs, this can be rather OP for crit-fishing builds. My advice is to implement a level-based scaling mechanism of DR-bypassing based bonus damage here. The order of the Flagon is the Cayden/drunken master/dwarf-themed order, using Cha instead of Dex for Acrobatics and being rewarded via bonuses when chugging a drink prior to engaging in such activities. Challenges render the member of the order immune to fear (here scaling immunity for progressively more powerful fear-condition immunities would have been more balanced and nuanced) and the order can charge in crooked lines – not only with a 1-movement change caveat as per usual, but completely freely – which is VERY strong. 15th level provides the obligatory late cone of class level x d6 fire-breath, usable Con-mod times per day. The feats here are interesting – Drunken Strength allows for the target to down a strong drink to temporarily get +2 Str for Constitution “bonus” (should be “modifier”) rounds, minimum 1. The feat can be taken multiple times, the Str-bonuses stacking – which is pretty nasty – particularly considering the lenient Con 13 prereqs – the lack of maximum times you can take this allows for some pretty nasty min-maxing. I’d take the Barb’s rage progression as prerequisite minimum level guidelines and instead increase the rather low benefits (+1 Str) subsequent taking of the feat nets to determine when you can take this feat additional times to prevent that…though I do like the chance the use sickens you. The second feat allows for the combination of the order and feat-based Str-boost ability in one fell swoop. The order of Fortune’s challenge can use steal and dirty tricks instead of regular attacks in a challenge and gets Quick Draw and Quick Sheathe as bonus feats, the latter of which is reprinted here – though personally, I prefer Dreamscarred Press’ version of the latter feat. At 8th level, weapon specific feats like Weapon Focus instead apply to Int-mod weapons, while 15th level provides another order’s 2nd or 8th level ability. A new feat allows you to stack two magic items in a slot – which is problematic, considering the amount of combos the system doesn’t account for – this just begs to create difficulties and is a prime example of playing rough and loose with the rules. This feat is not getting anywhere near my table. The order of Luck must randomly choose the target of his challenge and gets a unique skill-based ability: Cha-mod times per day, he may flip a coin and either gain 1/2 class level as a bonus to the skill…or, if he loses, 1/4 class level as a penalty! Unique! Also interesting: The 2nd level ability is predicated on taking two approaches to a task: Either sneaking past a creature or fighting it, for example. The character flips a coin to determine which to take and receives a bonus – but failing to take either renders the cavalier shaken. At 8th level, the order gets a reroll and at high levels, he can even change natural 1s into 20s. There is also a new feat that lets you take a natural 1 and treat it as a 20…but as a consequence, your next 20 is treated as a 1. Now see, this one is UNIQUE, captivating and takes a classic trope and plays it in a unique way – two thumbs up! The order of the Road gets AC-bonuses when moving at least 5 ft. in challenges, receives less penalty when fighting defensively and at 8th level, receives woodland stride and trackless step. 15th level duplicates blessing of fervor. (And should be designated as SP.) The order gets two new feats – one for an aurochs companion (with higher carrying capacity) and one for endure elements. Not that blown away here, though I like the visuals of the aurochs. The order of the Scorpion receives better trip and disarm capacity in challenges and at 2nd level, gets whip proficiency as well as the option to combine whip-based combat maneuvers with mounted charges. Additionally, they may, at 8th level, execute attacks with the off-hand against a foe tripped or disarmed – I assume at full BAB, but I’m not sure here. Do two-hand penalties apply? What about quick sheathing with the primary hand? The ability requires some clarification. 15th level provides Quarry. The feats provided here, though, are solid: Better Diehard, penalties for foes trying to lie to you and blinding whip attacks make sense and work. Cavaliers of the order of the Sea get challenge bonuses to atk while NOT astride a mount. 2nd level provides free movement through allies AND all types of difficult terrain and may freely charge while changing direction – again without a scaling mechanism or cap for turns -the combination of these is too soon at 2nd level – a scaling mechanism based on levels would help here. 8th level nets Cleave (or Greater Cleave if you already have it) and 15th nets Leadership. Okay, but none too interesting. The order is accompanied by 4 feats – 3 of which are pretty standard pirate/sea-themed ones, with the 4th providing teamwork grappling for easier enemy subduing. The order of the Sun penalizes the attacks of damaged foes of the respective challenge and may perform a channel-less turn undead at 2nd level. 8th provides bonuses vs. death effects and 15th allows for the temporary suspension of channeling negative energy – yes, this pretty much is the mirror of the order of the Black Rose. The new feats allow for +50% healing efficiency at the expense of +25% negative energy damage received. Not a fan of the fractions here. That being said, the second feat is cool, allowing for the expenditure of turn undead uses of the order in favor of bonus damage vs. undead. The order of Truth gets Will-save bonuses versus targets of his challenge and may not feint, dirty trick, etc. – a whole bunch of restrictions…for which he gain uncanny dodge and more Will-save bonuses. Not a big fan, as this takes active choice away for passive benefits, decreasing player agenda. At 8th level, this bonus extends to nearby allies and 15th level provides an EX-version of discern lies. The feats allow you to adhere to the order’s edicts and get rerolls from foes and there is a feat that allows for retributive intimidation after Sense Motive-win and one that allows you to deal more damage versus deceivers. Know how before I called the order of the Sun the opposite of the order of the Black Rose? Well, I was somewhat misleading you -Sun is the conceptual opposite; the honor, however, belongs visual-wise, to the order of the White Rose – -challenge nets dodge-bonuses to AC and is determined by a ward, through whose square he may charge and he also gains Saving Shield as a bonus feat (not capitalized properly in the text), gain better shield bonuses, shield other, and later, as an immediate action, take the effects of award’s failed save. The feats allow for more wards and one that decreases the damage taken from protecting your wards. The pdf closes with a new cavalier archetype – the Dual-Sworn cavalier. Instead of mounts and expert trainer, these guys receive a second order, whose edicts, benefits, challenge effects etc. STACK. That there is already the end for the archetype. Indiscriminate stacking of challenge-options, skills etc. just are not feasible within the frame of the class – they beg for conflicts galore, rules, falling apart and fringe-case-chaos, which is rather sad, for the foot-soldier charge-improvements the archetype otherwise gets are nice. Editing and formatting are pretty decent, though I noticed hiccups in formatting of spells and the like. Layout adheres to a two-column full-color standard and the pdf comes with a second, more mobile-device friendly version. The artworks contained herein are superb and may be what excited me the most about some of these orders. The pdf comes fully bookmarked for your convenience. Alex Abel and Tanner Wahlin have crafted some remarkable orders herein – while the concepts and visuals used, in many cases, hearken to classic tropes I’ve (and just about anyone else has) seen done before (sometimes time and again), the execution, for the most part, is solid and codifying e.g. drunken master as a cavalier hasn’t been done before. The same general solid craftsmanship can be claimed about the majority of the rules-language and decisions herein. However, at the same time, this is a classic example of a pdf whose finer mechanics grind and stutter under the weight of proverbial sand – both in balancing and rules-language: I love the order of the scorpion, theme-wise, but it’s execution with basically a hidden feat-tax to make one ability work and lack of damage-upgrade feels a bit weak. The order of fortune is all over the place with its tricks and honestly, didn’t feel particularly intriguing to me. However, we do get some damn cool ideas herein: the order of Luck’s coin-toss mechanics are inspired and fun and the defensive order of the White Rose does a decent job as well. An interesting observation: Balancing of both orders and feats herein, feats in particular, is not that consistent, so you may want to be careful with particularly the latter. In fact, both archetype and feats are what dragged this pdf down a notch – sure, jaded ole’ me has seen most of these order-concepts done as classes, archetypes, etc. and had no surprises apart from the order of luck and the cool order of the claymore herein – but ultimately, the orders themselves are on the positive side of things. Let me state this clearly: Barring the few cases where the pdf plays fast and loose with rules and balancing, this is pretty much a fun book of orders with some great visuals to supplement it. I just wished the rough edges had been filed off and that the balancing of a few of these components had been tighter. Think of this as a delicious hamburger with a couple of gherkins on it, when you really can’t stand them – consuming the broken bits is not an option and you can take them off and still eat a great burger, but a mild aftertaste remains. Similarly, you know how a hamburger tastes – it’s not fancy or will get you truly novel sensations, but it does satisfy your craving. What I’m trying to say is that this is a mixed bag. Sans issues, it would have been a good file; with them, I can go no higher than 3.5 stars, rounded down for the purpose of this platform. You can get this book here on OBS and here on d20pfsrd.com’s shop!